As always, John Rhodes and his wife are up with the lark and out in all weathers raising money to ensure the Children’s paddling pool will be reopened for Summer 2019. The Doggy Splash day at the start of October raised in total £1200. John is hoping to collect at least £2000 in total of the £5K needed to get it opened. 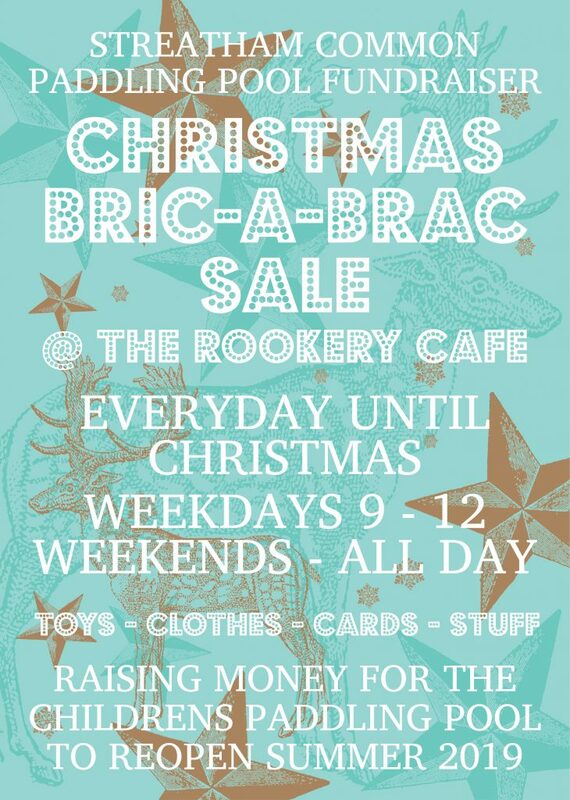 The stall has lots of fun, silly and useful items – Bric-a-brac – with 100% of sales going to the Pool fundraiser. Currently we are in negotiations with Lambeth Council about having the pump repaired….which all costs money! Johns stall will be up outside the Rookery Cafe until midday Weekdays and all day on weekends. Please show your appreciation to him when passing, either buying something, passing him any spare change or indeed you could inquire about doing your own fundraiser for this much loved play area. If you are a parent – we would love to see your involvement in keeping this vital corner of summer heaven alive and kicking.